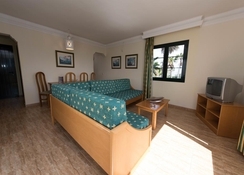 Palmeras Garden offers modern accommodation with air conditioning and Wi-Fi that suits groups of up to 4 people. 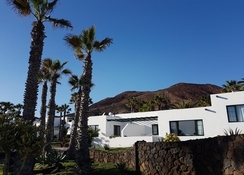 The establishment has apartments, studios and bungalows located next to the pool and guests will find a kitchen with ceramic hob, microwave and fridge, safe, bathroom with hairdryer and television. The holiday complex is a haven of peace and offers private parking and sports and leisure-oriented facilities, such as a tennis court, a swimming pool with children's area and well-tended gardens. The reception is open during the day and Palmeras Garden offers a bar-cafeteria with tables and a pool area. 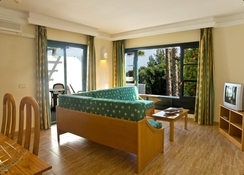 This hotel is ideal for families and couples and is located in Playa Blanca, southwest of Lanzarote. The nearest beach is about 20 minutes from the establishment. 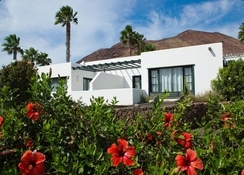 Palmeras Garden is located in Playa Blanca, about 20 minutes from the nearest beach and southwest of the island of Lanzarote. This part of the island hosts beautiful sandy banks and turquoise blue water, such as the beautiful Flamingo beach; the establishment is also located under the Roja mountain and is five minutes by car from the Pechiguera lighthouse. 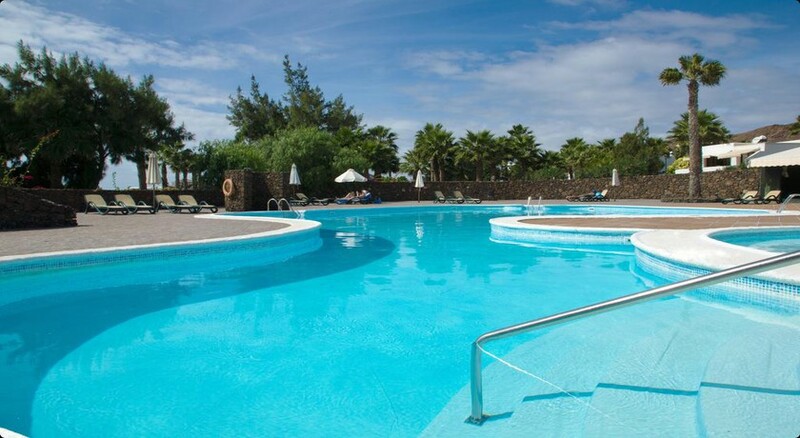 Aqualava Water Park is a 2-minute drive from the property and Timanfaya National Park is 40 minutes away. A quarter of an hour is the Atlantic Museum, which is located under the surface of the sea, and half an hour from the hotel you can find the Tanit Ethnographic Museum. The Lanzarote Airport is at a distance of 35km from the hotel. 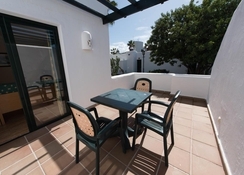 Palmeras Garden offers apartments for four people, studios and bungalows located next to the pool; the accommodation has a kitchen with ceramic hob, microwave and fridge. They have air conditioning, television, wireless internet access and safe, and the apartments also have a separate bedroom. The hotel offers a bar-cafeteria for guests. Enjoy all amenities for cooking in the well-furnished rooms with a fully equipped kitchen. The neighbourhood of Playa Blanca additionally offers a host of restaurants, bars and pubs for tourists to explore and sample Canarian cuisine and international drinks. Guests at Palmeras Garden will be able to enjoy a quiet holiday in this establishment oriented to families and couples, where there is a tennis court and two swimming pools: one for adults and one for children. Guests can use the private parking at the complex too. The reception is open during the day and in the lobby there is an information stand to find out about various excursion in the local area and a bookcase with various books to read at your leisure. Sports lovers have a tennis court and guests can also go for a leisurely stroll in the gardens. 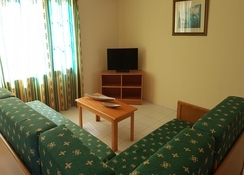 bus route outside gate and plenty taxi if needed english speaking staff and pool bar for snacks or lunch poolside short walk to promenade/boardwalk all the way to town centre.